The DC-10 was unloaded following a charter flight. 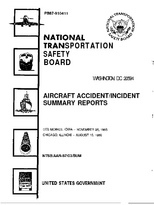 Company maintenance personnel had placed damaged passenger seatbacks (incorporating solid-state chemical oxygen generators) in the forward cargo hold with seat covers and oil. A company mechanic examined the seatbacks to find a serviceable unit. He encountered a loose oxygen generator, which he handled improperly by its oxygen hose. The generator went off by accident, generating a 430deg C heat. Seat covers ignited and the fire eventually burned through the cabin floor. The cabin was soon engulfed in flames. Lack of familiarity with aircraft .. company maintenance personnel"
Distance from Los Angeles International Airport, CA to Chicago-O'Hare International Airport, IL as the crow flies is 2784 km (1740 miles).